Factual error: When Dracula is about to bite the neck of his female assistant you can plainly see him in her vanity mirror and as all good horror fans know, you can't see a vampire in a mirror, especially Dracula. Visible crew/equipment: During the scene when Lou Costello is reading the narrative on Count Dracula we see the coffin door open and the candle on top of the box starts to decend. By the angle of the coffin door the candle would have easily fallen to the ground. If you look carefully you can see a thin black cord attached to the candle. Factual error: In no place on Earth does the full moon occur five times in a row, as it is in the movie. Continuity mistake: The second time Dracula opens his coffin, he places his hand on the side twice. Continuity mistake: In a shot early in the movie, Costello is retrieving a bag for a customer. When he pulls the bag from the middle of the cart, it falls below other bags and packages. But when the shot changes and Abbott asks which bag is the customer's, Costello points to a bag on top of all the others. Continuity mistake: When the boys remove the tarp from the coffin around 12 minutes into the movie, the sign to the left reads "Frankenstein's Monster." When Lou is left alone and looks at the sign it suddenly changes to "Dracula's Legend." 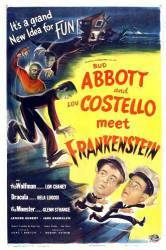 Other mistake: When Abbott and Costello are bringing the first crate (Dracula) into the house of horrors, Abbott tells Costello twice to help with moving the crate. The first time Abbott says to help pull the crate, which is correct. The second time, Abbott says to help push, even though Costello is still pulling. Other mistake: During opening scene, two faces of Big Ben show different times. One face shows 8:00 and the other shows 9:00. Dr. Lejos/Dracula: I must warn you my dear Sandra. I am accustomed to having my orders obeyed. Especially by women with a price on their heads. Dr. Sandra Mornay: Don't try to scare me, Count Dracula. Dr. Lejos/Dracula: Look into my eyes. Dr. Lejos/Dracula: Look! Deeper. Tell me what you see. At first, Lou Costello did not want to be in the film because he thought the movie was too silly. But when Universal (the company that made the film) offered him $50,000 to be in the movie, Costello said he would be delighted.